They were released in a set called DMX-22 Revolution Super Black Box Pack (232 cards) which is the second Black Box Pack. It contained a mix of reprints and newly unprecedented game and card mechanics, similar to the previous Black Box Pack, DMX-12 Black Box Pack. There are 24 packs in a box and each pack contains 6 cards. This set contained more collaboration cards than DMX-12, and collaboration targets extend to other Takara Tomy card games or CoroCoro comics, and even as far as to famous franchises such as Magic: The Gathering, Puzzle and Dragons, Sonic the Hedgehog and Toy Story. This set was first sold at the Next-Generation World Hobby Fair 2016 Winter on January 23 in Chiba, Japan, before the official release date of January 30, 2016. Sorted by A group (65 cards) and B group (167 cards). One booster has three A group cards and three B group cards. Both Jace, the Mind Sculptor and Nicol Bolas belong to B group. They only exist in foil version. Gokai!! Joragon Go Fight!! 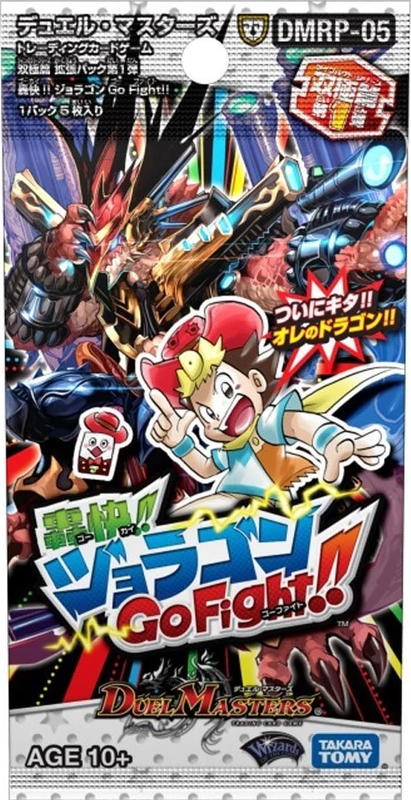 is the 5th DMRP booster pack in the OCG, it was released on March 31, 2018. Block: Twinpact Series. Nicol Bolas belongs to the Ultra Golden Cards group. It only exists in foil version. It features a new Card Frame for cards that are half creatures and half spells, these are known as Twinpact.